Researchers positioned a newly-designed high-definition video camera in front of natural hydrocarbon seeps and recorded bubble behavior of oily bubbles and mixed (part-oil, part-gas) bubbles. Photo courtesy of Ian MacDonald (ECOGIG, FSU). Scientists video recorded bubbles released from natural seafloor seeps in the Gulf of Mexico to determine the rate and volume of oil and gas released. The researchers observed that oily bubbles were larger and released more slowly than gaseous or mixed (part-oil, part-gas) bubbles. 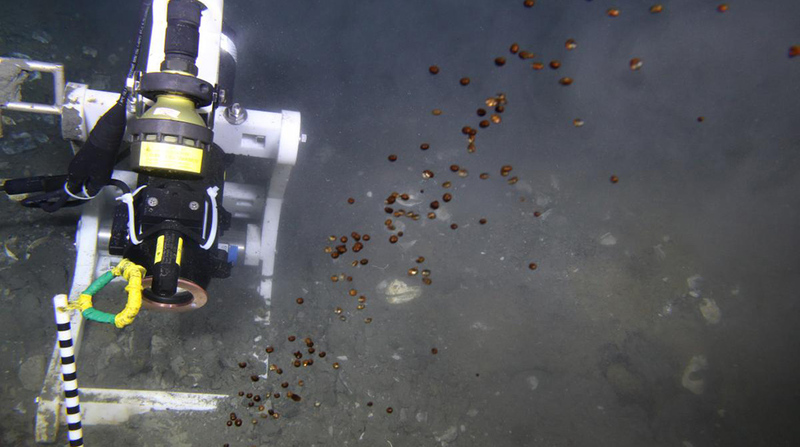 This study is the first attempt of long-term camera deployment at deep-sea vents. The researchers published their findings in Marine and Petroleum Geology: Time series video analysis of bubble release processes at natural hydrocarbon seeps in the Northern Gulf of Mexico. Researchers in earlier studies estimated the size distribution, behavior, and fate of gaseous bubbles rising from natural hydrocarbon seeps using a “snapshot” video footage lasting seconds to minutes separated by significant time gaps. The authors in this study contend that deployments of autonomous camera systems lasting days to months are necessary to capture the temporal and spatial variability, biological effects, and changing content of oil and gas bubbles. The team analyzed bubbles rising from two natural seep sites, lease block GC600 (1200 m depth in an oil producing area) and MC118 (850 m depth), from imagery collected by a compact camera (640×480 pixel resolution, 1 frame/4 seconds) and a newly designed time-lapse camera (1080×1920 pixel resolution, 29 frames/second). State-of-the-art reproducible image processing techniques that the team developed helped them determine the bubble type (oily, gaseous, and mixed), size distribution, release rate, and temporal variation. They also developed an algorithm to analyze bubble count and release rates from the video data. Two vents at GC600 released oily bubbles with an average 5 mm diameter and rates from 1.3 to 4.7 bubbles per second. Two different vents at GC600 released mixtures of oily and gaseous bubbles with an average 3.9 mm diameter at rates ranging from 49 to 81 bubbles per second. The vent at MC118 released gaseous bubbles with an average 3 mm diameter at a rate of 127 bubbles per second. While other factors may affect bubble size and speed (vent size, pressure, migration pathways in sediment, and gas hydrate mounds), the researchers’ observations confirm that the bubbles are larger and slower when more oil is present. The vent at MC118 developed a significant lag (±6 h) in bubble release as neap tide approached. The team hypothesized that this observed sensitivity to tidal fluctuations could be related to the site’s shallow depth compared to the other study sites or the lack of oily components in bubbles. While the team’s observations suggested a correlation between tides and bubble release, their findings were not consistent enough at GC600 to generate a firm conclusion. Study author Ian MacDonald explained that these findings are the beginning of an intensive study focusing on natural hydrocarbon seep dynamics and the geophysical processes associated with bubble release, “The present results contribute to ongoing research that seeks to model the transfer of petrocarbon from subsea reservoirs, through seeps, and into the water column.” Such findings are needed to better understand the role seeps play to mineralize and sequester oil that might otherwise enter the environment. Data are publicly available through the Gulf of Mexico Research Initiative Information & Data Cooperative (GRIIDC) at 10.7266/N7M906N3. The study’s authors are Caroline Johansen, Austin C. Todd, and Ian MacDonald. This article originally appeared online here, and was written by Maggie Dannreuther (GoMRI). This research was made possible in part by a grant from the Gulf of Mexico Research Initiative (GoMRI) to the Ecosystem Impacts of Oil and Gas Inputs to the Gulf-2 (ECOGIG-2) consortium. Other funding sources included the National Science Foundation (EF-0801741).